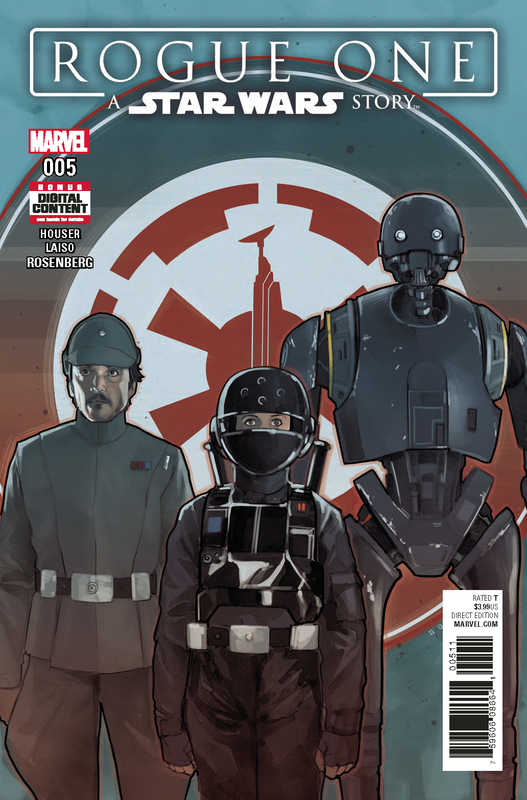 Rogue One #5 covers the departure from Yavin, the arrival on Scarif, and the beginning of the ground battle. There’s a couple bonus scenes, but nothing too special. All in all, this portion of the adaptation doesn’t offer a whole lot extra. Unless you’re a Raddus fanatic. 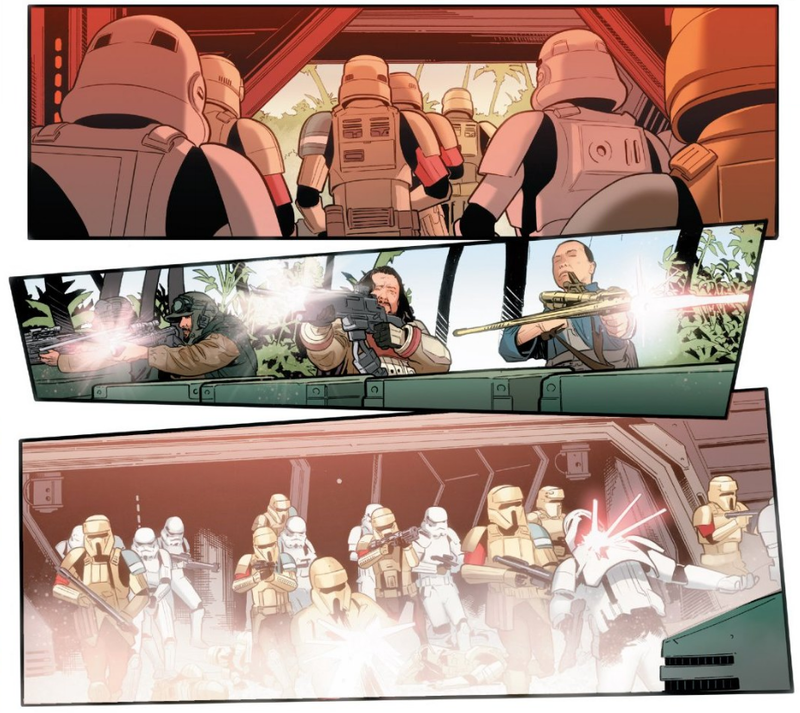 This issue opens and closes with two bonus scenes of Admiral Raddus. 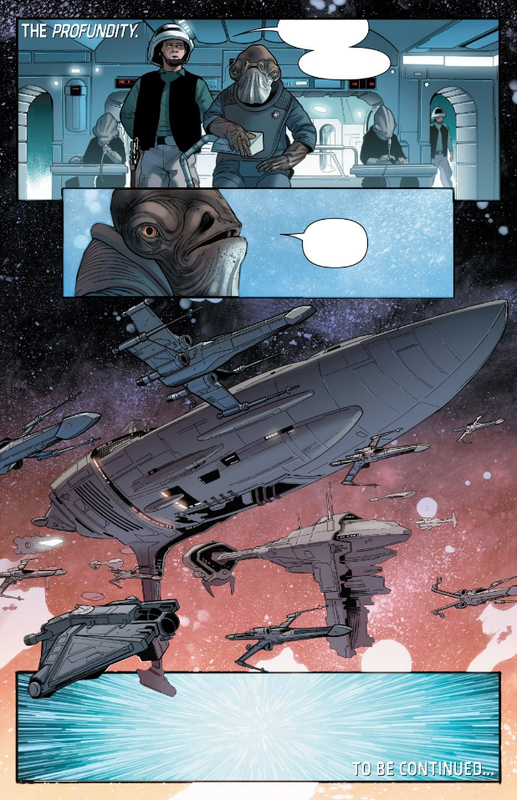 While I am a huge fan of Raddus, and he does have a strong fan following, the two extra scenes aren’t enough to make this issue worth the money for purchase. However, it might make it worth your time to seek out the issue and read it in the store. That said, there is more extra goodies crammed into this issue. There’s a dialog between Jyn and Chirrut talking about her necklace, serving the Force, and taking out the Death Star which is a desecration of the Kyber Temple due to its misuse of the kyber crystals. There’s an illustration showing Jyn thinking of her father and Saw before delivering her speech to the troops. There’s an added scene between Bodhi and K-2SO about reprogramming and bravery. An extended scene of K-2SO tricking a fellow Imperial security droid. Plus a couple other extended scenes. While it’s nice to have all the extra content, none of it really changes the movie or the story any. It’s nice, but it’s not really significant. The art is pretty good throughout the issue and the character likenesses are spot on for the most part. There’s a few panels that standout, otherwise it’s a good visual adaptation of the film. Really I can’t fault the artwork or the writer for the issue, but in the end, I can’t say that this comic is really worth the money. On one hand, Marvel did try to deliver extra content to the readers, but on the other hand, providing extras in itself isn’t enough to make it worthwhile. For the extras to count, they have to be significant. They need to add more to the characters or the story. As is, I give Rogue One #5 a three out of five metal bikinis.